Every year, Silicon Valley Toxics Coalition (SVTC) conducts a world-wide survey of major manufacturers of solar photovoltaic (PV) modules, focusing on environmental and social responsibility. Factors examined include recycling systems and policies, waste management, workers’ rights, workers’ health & safety, ethical sourcing of materials, and management of finite resources. The results are based on an annual survey, as well as prior survey responses, interviews, news stories, and publicly-available data. The resulting ‘Scorecard‘ helps to identify manufacturers with a real commitment to high standards of environmental and social responsibility. 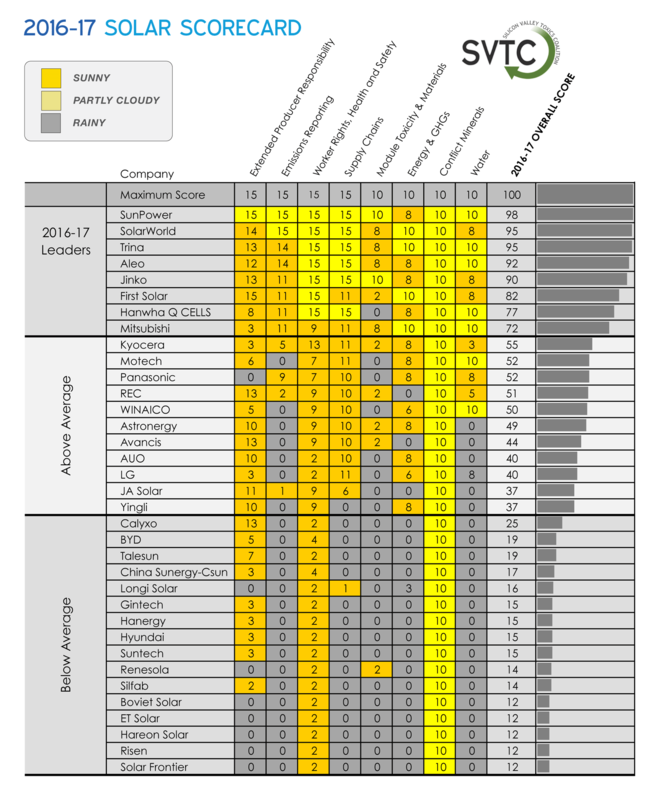 Results for last year (2018) have not yet been released, but Mode are very happy that the panels we recommend both rank highly on the current Solar ScoreCard. It’s nice to know that SunPower, world-leader in efficiency and performance, also leads the way in social and environmental responsibility.